Bengaluru: “Healthcare in India needs increased funding and policy intervention. In India, people tend to take healthcare issues to politicians and bureaucrats, while doctors are kept out of the management aspect. Healthcare can be transformative to India’s growth. 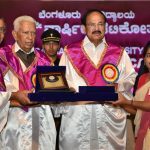 Hence summits like ‘Ayusmat’ at IIMB are vital to throw light on fundamental issues of healthcare like financing, quality, insurance, price capping, efficiency, accessibility,” said Chief Guest K. Sujatha Rao, author and former Union Secretary of the Ministry of Health and Family Welfare, Government of India, while talking about ‘Indian Healthcare Scenario – Actual vs Ideal – Roadmap to Bridge the Gap’ at IIM Bangalore, on Sunday (March 03). Ms. Rao was speaking at Ayusmat 2019, a healthcare leadership summit organized by the participants of the General Management Programme for Healthcare Executives (GMHE) at IIM Bangalore. Ayusmat is a platform for academicians, researchers, students, practitioners, policy makers, CXOs of healthcare organizations, health-tech consultants, venture capitalists, start-ups and thought leaders in the field of healthcare. The theme for this year’s ‘Ayusmat’ was Cost, Quality and Accessibility, the three aspects that pose the greatest challenge for efficient healthcare service delivery. Different sectors interlacing with healthcare, namely Finance, Management and Leadership, Policy, Technology, Insurance, Pharmaceutical, and Start-ups, amongst others, play a significant role in designing service delivery systems that balance these dilemmas. The closer healthcare providers approach the ideal of high medical access and quality at the lowest possible cost with innovation, the better they are at delivering value-based care in their healthcare models. The deliberations of the conference aimed to address these issues in detail. 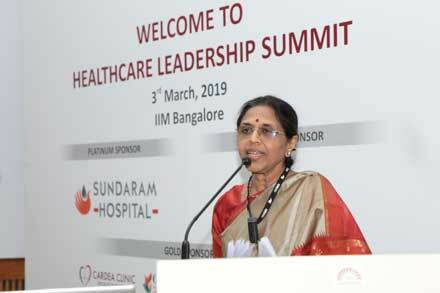 Dr. Chitra Sarkar, Dean (Research) and Professor of Pathology, AIIMS Delhi, while discussing ‘Leadership in Healthcare – Does it Demand Uniqueness?’ focussed on the aspect of ‘Medical Leadership’, based on research conducted by AIIMS. “Leadership needs to align vision, culture and operations to deliver sustained value. A leader has to implement innovation and change,” she observed. She defined Medical Leadership as a physician’s ability to serve both as a leader and manager of diverse teams in pursuit of maximally effective patient care. “Transformational Leadership is more important than Transactional Leadership. The leaders should be able to think about the way things are and how they should be. Leadership requires talent with passion, attitude, and skills to seize new opportunities, understanding of external factors like IT, economics, finance, new insights on best practices, etc., being self-aware, being able to take calculated risks, and being ethical. You don’t have to have position to be a leader and you cannot make everyone happy”. The first half of the day also saw a panel discussion, titled: ‘Healthcare Financing in India – What and Who will be the Game Changer?’ moderated by Dr. Srinivasa Rao Pulijala, Chief Executive Officer, Apollo MedSkills. The panelists spoke about world-class hospitals on one hand, and people struggling for accessibility and affordability on the other, the start-up ecosystem addressing the challenges, funding, etc. Dr. J Radhakrishnan, IAS, Principal Secretary, Health and Family Welfare, Government of Tamil Nadu, recommended sustained, preventive and promotive health as well as innovative partnerships. Amrita Agarwal, Health System Design, Bill and Melinda Gates Foundation, discussed insufficient funding for the sector, sources of funding and said proper utilization is needed to get maximum value. She also spoke about other problems like lack of outcome measurement and a fragmented healthcare system. Dr. Ramesh B, Managing Director, Endiya Partners, discussed how healthcare system is evolving in India and the role of start-ups. He said there is huge scope for innovation in the sector and that data is a crucial factor. All the panellists were united in their opinion that all stake holders in the healthcare system need to work in tandem and that there were more positives than negatives in the sector, today. “It is our India, and it is up to us to take it forward,” said Dr. Pulijala. The second half of the day saw another panel discussion, titled: ‘Transitions Driven by Innovative Technology in Healthcare’ was moderated by Professor Shankar Venkatagiri, IIMB faculty from the Information Systems area and Director, GMHE. It featured Arnab Chattopadhayay, Associate Director, IBM, Dr. Jagdish Chaturvedi, Founder and CEO, HiiiH Innovations Pvt Ltd., Mohammad Ameel, Senior Consultant, NHSRC, Anil Kumar Jagirdar, Principal Consultant (Healthcare), PwC India, Kedar Medhi, Director, Philips HealthWorks, Nirod Kumar Singh Thokchom, Director MEASA, Frost & Sullivan. This was followed by a debate on ‘Will Price Capping in India Kill Quality and Investment in Healthcare?’ featuring Ganesh Sabat, CEO, Sahajanand Medical Technologies, Dr. Ravi Kannan, Director, Cachar Cancer Hospital and Research Centre, Assam, and moderated by Dr. Santosh Kumar, Senior Advisor in Healthcare Quality Assurance.